1 drawing on paper ; matted image 4.75 x 6.75 in., mat board 8 x 10 in. 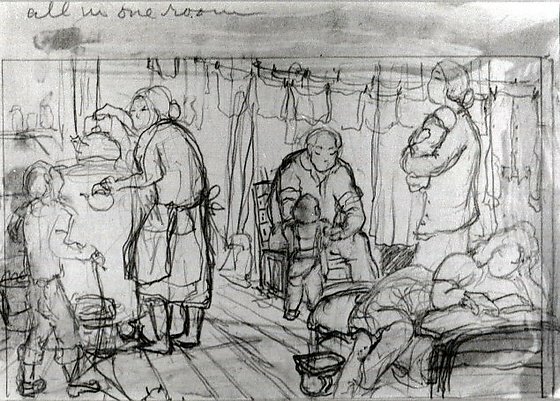 Pencil sketch of family life in barracks of Heart Mountain concentration camp. A woman gets hot water for tea from heating stove on left as boy talks to her. Man sits in chair under laundry line of clothes with a small child standing before him. Woman holds an infant, right, behind a woman lounging on a bed in foreground. Line border. Written in pencil, top left: all in one room.